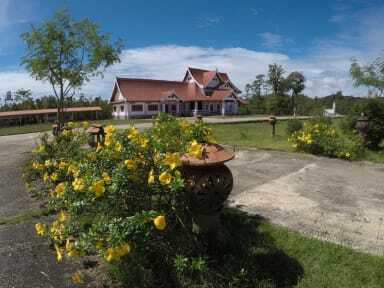 Nakai Resort is located in the heart of the Khammouane province and around 1 hours’ drive away from Thakhek City, the resort is surrounded by breathtaking nature and situated next to a beautiful Nam Theun lake. Previously our Resort used to be open for government use only, though today anyone can join us and appreciate the striking surrounding areas. It's the perfect getaway for people wanting to flee the hustle and bustle of city life and experience the atmosphere of the traditional Lao culture. Thanks to peaceful and unique nature guests will have a great time strolling around and exploring the area, fishing or enjoying stunning view-points. Our exquisite resort contains six Laotian Cottages with traditional architecture and modern facilities. We have a large meeting room onsite, with modern audio facilities. Our outdoor lakeside restaurant provides breakfast from 7 am until 10 am and also serves delicious home-cooked lunch as well as evening meals. If you are planning on taking some food along your trip, no worries - packed lunches are also available for your day trips. Accommodation can be found within Nakai Resort for all needs and budgets, ranging from dorm rooms to family rooms and private rooms. All rooms are equipped with air conditioning, a TV and a minibar. Some of our rooms have balconies offering great views over our garden areas. For those partaking in the Thakhek loop our resort is situated in the perfect location for you to relax after visiting the magnificent caves and waterfalls in the surrounding areas. Free WiFi is available in all rooms and in the public areas. I stayed in the dorm room at the resort following a long day of biking on the Thekhek loop. I had such a lovely time here. The resort was clean and the staff were amazing and super friendly. The night club was fun to visit on an evening and the food at the restaurant was delicious. I would recommend this place to anyone who wants somewhere friendly and clean to visit during taking part in the Thekhek loop or just as a nice place to visit. Thank you for looking after me and see you again soon.